The papaya (Carica papaya), or pawpaw is the fruit of the plant Carica papaya in the plant family Caricaceae. It is native to the tropics of the Americas, perhaps from southern Mexico and Central America. The papaya (Carica papaya), or pawpaw is the fruit of the plant Carica papaya in the plant family Caricaceae. It is native to the tropics of the Americas, perhaps from southern Mexico and Central America. The papaya is a large, tree-like plant, with a single stem growing from 5 to 10 m (16 to 33 ft) tall. 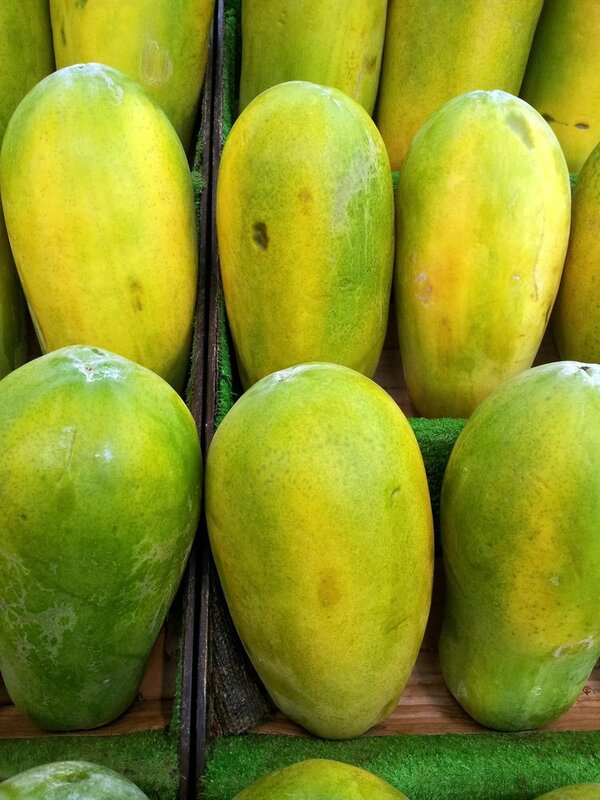 Two kinds of papayas are commonly produced. One has sweet, red or orange flesh, and the other has yellow flesh. Here are the 7 health benefits of papaya. 1. Papaya can help individuals fight infections. One cup of papaya contains 144 percent of the vitamin C daily requirements. Vitamin C is a powerful natural water-soluble antioxidant that helps the body develop resistance against infectious agents and eliminates cancer-causing free radicals in the body. 2. Papaya is great for the hair and skin. Adequate vitamin C intake does not only improve the immune system but can also create and maintain collagen, an essential protein found in hair and skin. Also, papaya contains 31 percent of recommended vitamin A. Vitamin A has been known to keep the hair moisturized through increased sebum production. Lastly, the presence of papain, a digestive enzyme, kills cells and purifies the skin. 3. Papaya can help you sleep better in the evening. Papaya has been known to help an individual sleep with its high content of magnesium, which is a mineral that is directly linked to improving the quality, duration, and tranquility of sleep. Papaya also helps regulate the metabolism, to help reduce sleep disorders and the occurrence of insomnia. 4. Papaya can contribute to maintaining a healthy blood pressure. Papaya has an incredibly high potassium to sodium ratio. One cup of papaya contains 360 milligrams of potassium, compared to 4.2 milligrams of sodium. This helps the blood vessels relax and maintains proper blood pressure, especially for individuals with hypertension. 5. Papaya can help prevent further kidney damage. Papaya contains a substantial amount of potassium, which is very helpful in cleaning or washing out the toxic depositions in the kidneys. The fruit also helps in reducing the concentration of uric acid in the blood and reducing the chances of kidney damage and the formation of renal calculi in that organ. 6. Papaya could help contribute to fighting cancer. Papaya has antioxidants like lycopene that seek and eliminate free radicals in the cell that turns healthy cells into cancerous cells. Lycopene has been shown to reduce the risks of prostate, breast, colon, lung, and endometrial cancer significantly. A study conducted by the University of Florida suggests that anti-carcinogenic effects of papaya leaf extract are stronger when the cells were given large doses of tea. 7. Papaya can help improve your heart. Elevated levels of homocysteine are a risk factor for heart attack, stroke, or peripheral vascular disease and are found in between approximately 30 percent of patients with heart disease. The folate in papaya lowers the levels of homocysteine in the blood. Papaya is also a good source of magnesium. This mineral helps the blood vessels relax and improves blood flow in the body. Tarachiwin, L., Masako, O., & Fukusaki, E. (2008). Quality evaluation and prediction of Citrullus lanatus by 1H NMR-based metabolomics and multivariate analysis. Journal of agricultural and food chemistry, 56(14), 5827-5835. Whelton, P. K., He, J., Cutler, J. A., Brancati, F. L., Appel, L. J., Follmann, D., & Klag, M. J. (1997). Effects of oral potassium on blood pressure: meta-analysis of randomized controlled clinical trials. Jama, 277(20), 1624-1632. Otsuki, N., Dang, N. H., Kumagai, E., Kondo, A., Iwata, S., & Morimoto, C. (2010). Aqueous extract of Carica papaya leaves exhibits anti-tumor activity and immunomodulatory effects. Journal of Ethnopharmacology, 127(3), 760-767.